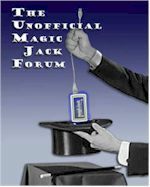 Does Magicjack really work as claimed? They say it works using your DSL connection. But my DSL connection depends on my AT&T phone line, disconnecting which would also disconnect my DSL. So how can Magicjack replace my phone service, as they claim to do? I've had MJ for over 6 years and yes, it does work. There are certain annoying items that have been well covered in this forum. Local telephone companies generally require you to have a regular phone line with them in order to get DSL service. Is there a cable company that offers internet in your area? If so, simply switch to that. If not, downgrade your existing AT&T phone service to the minimum: no call waiting, no presubscribed long distance, no caller id, no voice mail, no other premium services, etc. See if they offer an incoming only service at a reduced rate. If so, you'll be able to keep your DSL and then make your calls via the MJ.